The bar set by Woody Allen is high. With back-to-back successes in Midnight in Paris and Blue Jasmine in recent years, and the masterpiece comedy Annie Hall hovering over his career, he always has his work cut out. Since Magic in the Moonlight, he’s found a muse in Emma Stone. 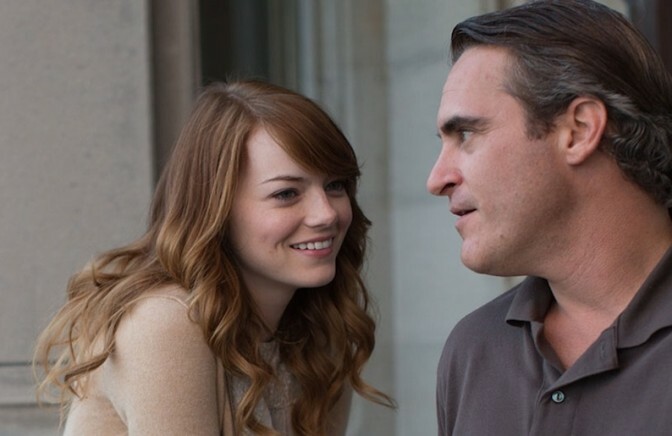 Irrational Man places her as the wide-eyed student Jo, fascinated by the alcoholic genius, Abe (Joaquin Phoenix). Philosophy student and professor respectively, they wander the college campus discussing Kant and Kierkegaard comfortably, before nonchalantly turning to impotence and lust. With a ‘perfect murder’ plot distinctly altering the tone, it becomes a one-sided Strangers on a Train, as Woody weaves in his personal experience of depression and neuroticism. The older, awkward man suddenly infatuated and indulging in trysts with a considerably younger woman is expected perhaps, but here it’s awfully out of place: it’s simply not needed. There’s a sense that, though experiencing Woody Allen’s working career on the cinema screen is a privilege, he often slides towards archaic plotting that jars with our current experience in modern movies. Irrational Man is steeped in theoretical musings, not unlike the dream-talk Richard Linklater enjoys in Waking Life. But, rather than merely a conversation, in Irrational Man it underpins an abuse-of-power between teacher and student. Crucially, Irrational Man isn’t about their physical relationship anyway, and the conflict of morality and consequence of events is intriguing and engaging. If only the cliché Woody Allen tropes didn’t pollute and delay the ideas pulling you in.